We come to the dark of the year in northern lands. This season is rich with possibility as well as fear. There’s a whole gamut of responses to the dark. I know I both love and dread the dark, yet I also know that the fertile darkness is a place of regeneration and healing. When I settle into darkness, I find the deep rest and inspiration of winter dreams. This dark place is essential for beginning a new cycle of growth as the Sun’s light begins to wax again. Those of us in the northern lands of this Earth are plunging into the dark, reaching the very center on Winter Solstice. In contrast, the southern lands are experiencing a surplus of sunlight at the beginning of their summer. Although I have a hard time comprehending the whole-globe experience of the seasons, I think astrology points us in the right direction when it uses the language of integration for opposite signs. Contrasting sides form a whole. The question becomes what is the integration of peak dark and peak light? The Earth holds this paradox naturally. Humans must figure it out for ourselves. So, I invite readers living in the southern half of the world to remember the dark as you expand into the light. Just as I invite those of us in the north to remember that within the darkest moment is a spark of contrast—the very opposite thing, which provides the regenerative energy we need. Paradox is fuel, just like wonder, just like curiosity. This lunar cycle, I’ve been holding the paradoxical emotions of hope and despair. Just like seeds of the dark and light are hidden within the solstices, hidden with hope is despair and within despair is hope. Lately, I’ve been thinking about the concept of spiritual bypassing, an insight originated by, psychologist, John Welwood. In an interview in Tricycle Magazine he describes it: “When we are spiritually bypassing, we often use the goal of awakening or liberation to rationalize what I call premature transcendence: trying to rise above the raw and messy side of our humanness before we have fully faced and made peace with it.” Holding the contrast of hope and despair is an opportunity to notice how quickly I want to jump into hope to bypass the pain I feel. My practice is to know that both hope and pain exist. In my winter, somewhere else in the world summer is starting. I know that the totality of experience is vast. Hopes and despairs are very real and co-existing. How much can I expand to take that in? 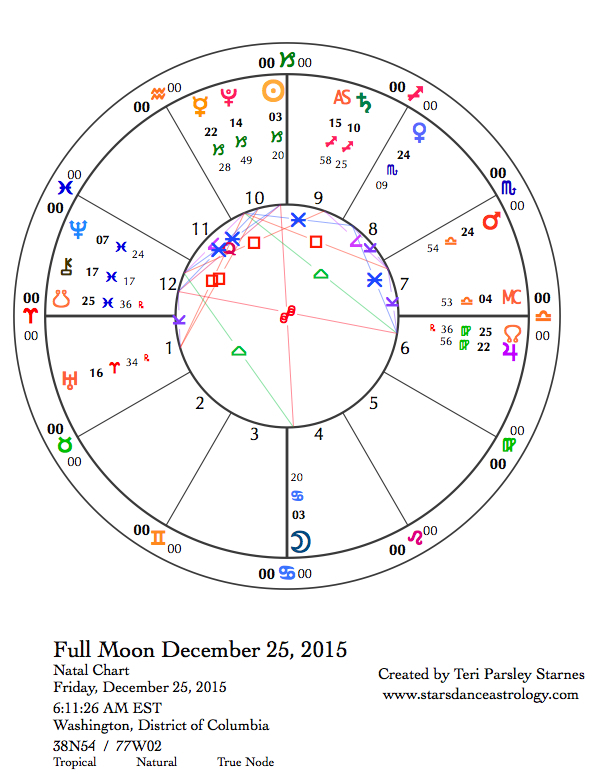 There is a Full Moon in Cancer on Christmas this week. Full Moons teach us about the integration of opposites. In this case, the Cancer/Capricorn integration. Whether or not Christmas is part of your tradition, this time of year often provokes big reactions, big adjustments. How much can we expand to take in the contrasts we feel at this Full Moon? Another important question is, how do we find stability even as we notice these paradoxes and contrasts? Inner and outer gymnastics may need to be performed to keep re-adjusting and re-finding our ground. May we live in grace. May we stay with the present moment, noticing the contrast of dark and light, hope and despair, within us and around us. Entering the fertile darkness, may we each find the dream that brings renewal. Under the attention of the Gibbous phase of the Moon, we begin the winter season. Expectations are high under this phase. These expectations are more useful as information rather than motivation to shame or blame ourselves. In the Northern Hemisphere, the season of fertile darkness begins. The Solstice chart shows a grand earth trine blessing the regenerative potential held in our winter dreams. The Moon in Taurus (fixed earth) helps us find the stability to stay present to all the contrasts that the dark season can bring. This earth energy may be telling you to slow down, which is hard to accomplish at the holidays. Pay attention to the contrast between the passing season of Sagittarius (mutable fire)—ruled by Jupiter who encourages us to do more and more—with winter season of Capricorn (cardinal earth)—ruled by Saturn who is more interested in the strict management of our energies and resources. We are eased into earth’s wisdom by the other earth planets: Jupiter in Virgo and Pluto, Mercury, and Sun in Capricorn. Another dynamic feature of the solstice chart is an opposition between Venus in Scorpio (fixed water) and the Moon in Taurus. Scorpio likes to keep things real. We sniff out dishonesty, power grabs, repression, and greed with fierce intensity, especially in relationships. If we pass the test, we reap the sensual presence of the Taurus Moon. No fake peace this winter, it has to be real and earned. Tuesday, December 22. Keeping it real is much better than pretending you’ve got it all under control. The day starts under the influence of the Moon in Taurus (fixed earth) opposing Venus in Scorpio (fixed water), which draws out the contrast between emotional stability vs. authentic interactions with others. We may be drawn to an edge only to find that if we risk releasing control, we find much more stability. This uncomfortable aspect is soon followed by a trine between Jupiter in Virgo (mutable earth) and the Moon. Earth wins the battle, which may result in extravagant spending. You’ve been warned. Wednesday, December 23. Ahh, those mutable signs, so fun-loving (usually) and so prone to jittery nerves. Today is all about that contrast. The Moon in Gemini (mutable air) forms a challenging t-square aspect with Neptune in Pisces (mutable water) and Saturn in Sagittarius (mutable fire). It is possible to turn off the over-stimulating input and find a way to enjoy every encounter today. Remember to satisfy your need to share and learn while anchoring into inner peace (Neptune). Saturn encourages honest self-reflection. Thursday, December 24. Much of the conflict for the last couple of weeks appears to be behind us. But, if you’ve been repressing anger, then today’s transits could loosen your control over your frustrations. The Moon in Gemini (mutable air) makes a square aspect to the nodes. This happens twice a month, but could be all the fuel we need to trigger a release. With the Moon in Gemini for most of the day, the focus may be on communication. How frustrating is it to understand others? People may show their exasperating side today. Not all is stressful. Last minute Christmas shopping is stimulated by a sextile between Venus in Scorpio (fixed water) and Jupiter in Virgo (mutable earth). Just remember, everyone else will be in the stores too. If you are the type who enjoys crowds, go for it. Otherwise, you may use the time to notice what is motivating the need to buy more right now. Uncomfortable emotion (Scorpio) and feelings of imperfection (Virgo) could be behind the impulse. 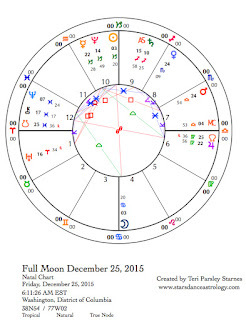 December 25—Full Moon: Illuminating. Remember the Taoist symbol for yin and yang today under this winter Full Moon. The swirling image of a circle of light and dark with small contrasting dots shows that within any extreme, the seed of the opposite quality resides. There is no good and bad between the extremes, only information and potential when we can integrate them. Today, the Moon in Cancer opposes the Sun in Capricorn showing us the extremes of summer’s abundance (Cancer season) with winter’s restrictions (Capricorn’s season). Other qualities are in opposition too. As a water sign, Cancer processes through emotion, providing nurturance and support. As an earth sign, Capricorn process through judgment, weighing the pros and cons and outcomes. This law of opposites helps us with intention as well as self-awareness. If I want to have more Capricornian authority then, it would be a good idea to look at my needs to mother and caretake others. They are related. Being in good balance with my authority and my obligations to others, helps me to access both qualities in my life. All of this is context for a day that we may be spending with family members, noticing who is the authority and who is the caretaker in this group. Are you unsatisfied with your role or your response to either of these roles? Today, you may want to remember that Taoist symbol. There are always seeds. Claiming authority, while maintaining empathy for others, will help us stay self-aware and grounded as the planet of disruption, Uranus, stations direct in Aries (cardinal fire). For the next seven months, Uranus blazes forward into the sign of the individual. Each of us has the opportunity to change some aspect of our identity so we may become part of the communal changes needed in the world. Make space for individual expression today to accommodate this big energy. The trine between Mercury in Capricorn (cardinal earth) and Jupiter in Virgo (mutable earth) encourages useful conversations. We are intrigued by technology and systems that improve our lives. Come to the holiday table with a list of helpful life hacks. Everyone will appreciate you. Saturday, December 26. The Cancer (cardinal water) Moon comes out fighting today. The issue may very well be that we don’t feel appreciated enough. This is place Cancer knows well and is a warning sign that we aren’t doing enough self-care. Today, the Moon opposes Pluto, squares Uranus, opposes Mercury, and squares Mars. Your experience may be that someone else is resentful of taking care of you. The best qualities of the cardinal signs will take responsibility for themselves when they are reminded. Relationships may need some honest airing of frustrations today. In the public arena, people may be feeling even more polarized and defensive. Give others room to vent. Sunday, December 27. The Moon entering Leo (fixed fire) will most likely feel like a breath of fresh air. After an intensive experience of hearth and family, we are ready for some fun and self-expression. Fortunately, the Moon makes no major aspects with any other planet today (in the CST zone), and the only aspect it does make in western time zones is a helpful trine with Saturn. Saturn’s influence will encourage temperance as we let loose a little.